Cheshire West and Chester Council has extended its free parking offer in Ellesmere Port’s Westminster car park following a 46 percent rise in usage. Working in partnership with the Town Centre Improvement Advisory Body, the Council implemented free parking for up to four hours in April 2014 in a bid to welcome more visitors, increase footfall and support the shops along Whitby Road and the rest of the town centre. Following its success, the offer has now been extended for another year until April 1, 2016, funded by the Town Centre Improvement Advisory Body. Executive Member for Localities, Councillor Lynn Riley, said: “This initiative has been a great example of the council working in partnership with the local community to highlight their needs and find real solutions. “The Town Centre Improvement Advisory Body is made up of local people and organisations who are all working towards one aim, making Ellesmere Port a better place to live, work and visit by improving the town centre for all. Previously costing 50 pence to park for up to two hours and £1 all day, the cost of staying longer than four hours remains priced at £1. Motorists should continue to display a ticket, available from the Pay and Display machines on site, in their vehicles which will indicate arrival times and prevent overstaying. Chairman of the Town Centre Improvement Advisory Body, Les Lyon, said: “The Advisory Body is very aware of the benefits that a scheme like this can bring to the town centre and a 46 percent rise in usage is great news for traders. The aim of the project is to attract more shoppers to Ellesmere Port’s historic high street Whitby Road, which has seen vacancy rates drop in the past two years from 24 percent to 7 percent – half the national average. Local member, Councillor Justin Madders, said: “I am pleased that the initiative launched a year ago has seen success in drawing people into the bottom end of the town. More cars bring shoppers, footfall, and wealth to the town centre. Part of a programme of town centre improvements designed to support the transformation of the heart of Ellesmere Port, the scheme is prioritised in the Vision and Regeneration Strategic Framework of the Ellesmere Port Development Board. 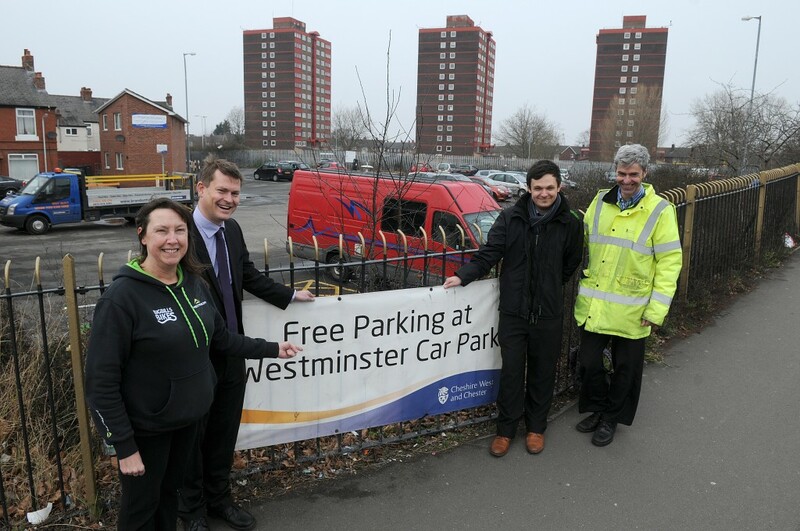 The Council has also made Wellington Road Car Park free of charge for six months from 14 February 2015. Left to right: Pauline Billings, Big Bill’s Bikes, Councillor Justin Madders, Locality Support Officer Garrett Jones and Town Centre Improvement Manager, Jochem Hollestelle.